This reading guide can be printed or displayed as students read, "Checkouts" by Cynthia Rylant. 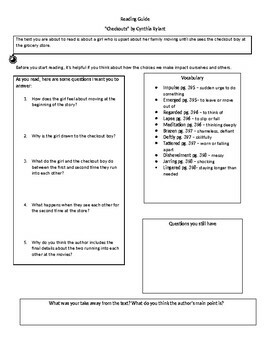 It features guiding questions to chunk their reading, a vocabulary reference section, and places for them to record their questions and takeaways. Using this reading guide as a scaffold will help give struggling readers more focus and will enable teachers to see student learning and confusion right away.